[Review] Is Job4Living.com Real or Fake? Good day! Today, I will be making a review post about this site Job4Living. You might heard or saw it in your feeds that this site gives a decent job. Okay, I reviewed JobRize which has similar offer, but as the rule goes — be skeptical. If you are looking for a decent job, then you must extremely research about websites that offer jobs. Brief: Is Job4living worth to work for? Answer: NO. It's kinda silly if you do. We well see later why you don't want this website. We will start with the naming domain. The website says it all, jobs for living. But is it really true? Looking its logo makes you wonder, why such plain and simple logo made? No, I am not great designer, but as exposed to some designs, this logo is definitely not a catchy though. 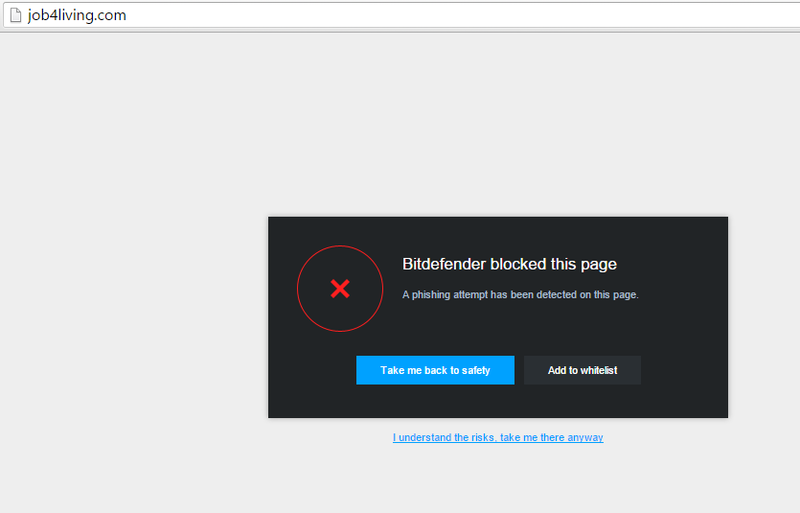 Note: BitDefender blocked the page, because it sees a PHISHING attempt on the website. Want to prevent from Phishing? Don't get me wrong, BitDefender is the number 1 anti-virus for years. So this is kinda valid. Job4Living is a new innovating and internet job site, where you will be hired to do some tasks, different in type and number. and you will be paid a estimated reward for that instant in your account, after it the job poster will review the service and approve the status for your payout, then you will be paid for your work via Cheque. Other Payment options are also coming soon. You have to create a account with us to start and login to your member area, and do daily your jobs and you will be really great after using our service. A signup bonus of 25$ might be eye-catchy, but the question is, do the website owners have the money to sustain it? Answer is obviously nothing. 4. Registration forms are ridiculous. Okay, name, address, email address, and cheque name. Like DUHHHHH. Again, middle finger for you! I'm quite in rage now, I certainly don't like its system, deceiving people for them to gain wealth and money! 7. Contact US is really ..ahmmm...damn f*ckin script. Where the heck are those discussions made from the website's members? Where? Where? I don't know. Now, it's really a big problem. Before a member can cash out their hard-earned-effort earnings, he/she first do some surveys, and after finishing it. It will gone like forever. There is no forever really and that's insanely true. 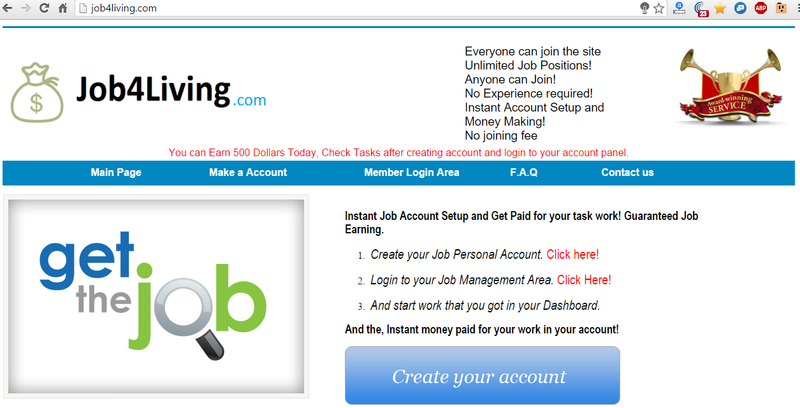 As you would know now, I would not recommend you to do some crazy stuffs with Job4Living. You will just exert time and effort for nothing. Kinda losing-battle of your life-living time... job4living eh? Are you kidding me? 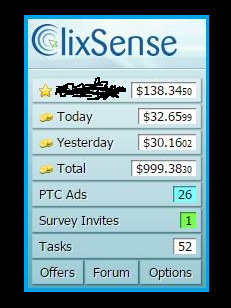 FREE with CLIXSENSE: register and click here. Okay, it's kinda has a low earning potential on clicking ads, like $0.01 per ads. But it is not a problem, you don't need to refer someone (but it is quite good too if you have friends),you will just need to do some tasks, and complete it. By levels, you can even earn up to $20 per day! Well, I am in level 0 today, but in the future, I would certainly reach level 3.